The lines were long at Providence Municipal Court with drivers waiting to challenge their $95 fine for alleged speeding. 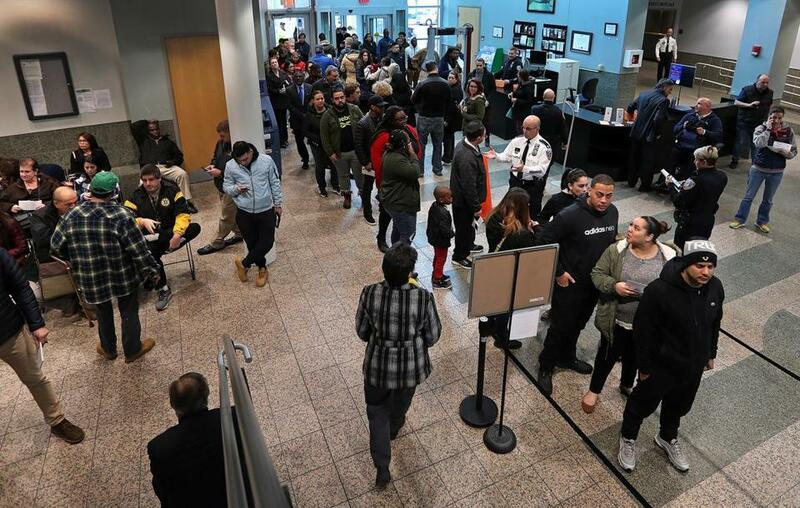 PROVIDENCE — The evening session of the city’s municipal court was still a full hour away, and already the Public Safety Complex had descended into madness. The lobby was jam packed. A line of people snaked out the door and down the sidewalk. And, boy, were they steamed — because the city had set up some traffic cameras and, over the course of a few weeks, issued more than 12,000 speeding tickets. We’ll say that again: Twelve THOUSAND. And with Monday being the first opportunity to challenge the tickets in court, a good many of the recipients arrived ready to give a piece of their minds. Complaints were abundant. There wasn’t enough warning, some said, or enough signs alerting drivers to the presence of the cameras. Others just thought the whole operation — and the tickets, at $95 each — was an abusive insult. Providence issued speeding tickets at 27 times the rate of Mass. During a recent stretch, Providence issued speeding tickets at a daily per capita clip that was about 27 times greater than that of police across Massachusetts. Defendants waited their turn to appear before Judge Daniel P. McKiernan. The seeds of Monday’s bizarre scene had been sowed last year, when the City Council approved the implementation of 15 traffic cameras. At the time, the idea had seemed logical enough — located near schools and in spots of the city where accident reports and traffic complaints were high, the cameras would bring an added layer of enforcement to vulnerable areas. The cameras snap photos of vehicles traveling 10 miles per hour or more over the posted limit, recording the speed they were traveling and using license plate numbers to issue citations to the owners. After the first set of cameras started operating in January, the result was rather astonishing. In a little over a month, the cameras dished out 12,193 tickets. As news of the scene at court and of the staggering ticket totals spread Monday, eventually drawing national headlines, city officials made attempts at damage control. Defending the cameras as safety tools, city press secretary Victor Morente also said Monday that an additional round of cameras that were activated this week would not be issuing citations for the first two weeks, only warnings. “We’ve heard the concerns,” he assured. Some people elected simply to acquiesce and pay their tickets by mail, and some came to court on Monday to pay in person. But many more, it seemed, came to go before a judge and fight. It was all a bit much, apparently, for celebrity Judge Frank Caprio, who, after gamely presiding over the day’s morning’s docket — which featured some 1,500 cases — enlisted fellow Judge Daniel McKiernan to handle the evening docket, which had about as many. Entering the courtroom a little after 5 p.m., McKiernan took his place behind the bench and promptly offered a caveat to the evening’s festivities: Due to the volume of visitors, he said — and a desire to get everyone home before 2 a.m. — he would be accepting no explanations on this night, just a choice: The accused could either plead guilty and pay the $95 fine, or declare their innocence and be granted a trial at a later date — which they did, one by one, over the course of the next three hours. Outside the courtroom, meanwhile, there was little to do but wait. Courthouse officials had done their best to prepare. Late last week, when it became apparent what kind of civic crush awaited, 80 plastic chairs had been excavated from the basement of the nearby police department and brought over to the courthouse lobby — though there were hardly enough for everyone, and a nearby auditorium had to be opened to deal with the overflow crowd. Trapped in this civic hellscape, the masses did what they could to pass the time. In the lobby, they picked at their fingernails or scrolled through their phones, pulled hoods over their heads and drifted off in uncomfortable seats. A defeated few simply stared blankly ahead. Every so often, a court official would step toward the center of the room and bellow out the next set of numbers, and a small group would move to a makeshift on-deck area near the courtroom entrance to continue waiting before being granted access to the courtroom. In they went, emerging an hour or so later either shaking their heads or — if they were one of the lucky individuals whose cases had been dismissed — with smiles on their faces. With the accused unable to mount arguments, the cases moved quickly, and as the night wore on, the crowd began to dissipate. By 7:30, it had dwindled to a dozen or two remaining cases, and from his perch behind the bench, McKiernan did his best to keep things jovial as the final cases crossed his desk. He smiled, joked, and engaged the children of the accused, until the night’s final case had been heard and the madness had drawn to a final, welcome close. At least until Thursday, when hearings for those who pleaded not guilty were due to begin.